Everyone loves dolphins! Learn about these gentle creatures by making some delightful dolphin crafts for kids using different kinds of art & craft supplies. Ask kids about which aquatic animal is their favorite and you’re likely to hear dolphins quite a few times! Maybe it’s the influence of Flipper or simply because they’re popular in water parks, but these mammals are a kiddie-favorite. Since 14th April is National Dolphin Day, we’ve decided to pick up some of the cutest dolphin crafts from across the net, made using all kinds of art and craft supplies. 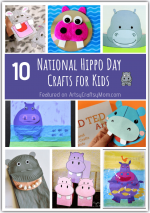 Googly eyes, pipe cleaners, paper, egg cartons, watercolors – you name it and it’s here! 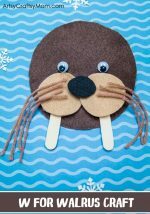 These crafts are perfect for kids learning about aquatic animals, especially if you’re planning a visit to the beach or water park this summer. Red Ted Art has a collection of animal bookmarks, but this dolphin corner bookmark is our favorite! Made with paper using Origami techniques, this is a cute little guy to keep you company while reading. Have you seen those images or videos of dolphins jumping out of the ocean through the air? Son Light Blog brings this to life in this cute and clever craft that uses two paper plates. Preschool Activities shows us how to make a dolphin that’s simply adorable! Once you get hold of egg cartons, then all you need are regular craft supplies like card stock, googly eyes and pipe cleaners. In my opinion, clothespins are pretty underutilized when it comes to crafts. However, Dzieciaki W Domu makes use of wooden clothespins to turn them into little blue dolphins. With paint, foam and googly eyes, you’re all set to make these guys! 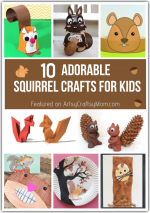 How pretty is this craft project from Craftulate? Foam dolphins swimming amidst tissue paper waves over an aquamarine sea – the multiple layers add a beautiful effect to this project. Memorizing the Moments shows us how paint spreads on a coffee filter to create a beautiful effect. The two dolphins in a yin-yang position add to the peaceful balance of this project. Want to make frame-worthy dolphin art? Check out this project from Sugar Spice and Glitter where you can learn how to make a resist painting with tie dye effect – what you get is an absolutely stunning piece of art! Got a kid learning the animal alphabet? Then this cute and colorful craft from That Bald Chick is just what you need! With craft foam and googly eyes, this is simple enough for preschoolers to make. If you’d like to get a little more science-y with your project, try out this leaping dolphin craft from Highlights. With an old CD and other recycled materials you can make yourself a fun toy that’s so satisfying. Mom Junction features a basic dolphin craft made of paper. 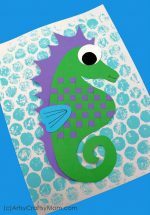 This is a great craft to teach kids about the colors of the ocean and how there are both blues and greens in the water. 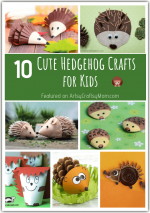 Even if your child wasn’t a fan of dolphins, she will certainly be one after making these cute crafts! 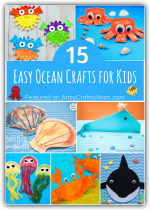 While you’re at it, you can also check out our collection of ocean crafts for kids, as well as an ocean themed scenery drawing prompt to exercise those creative muscles. Don’t be surprised if you find you have a little ocean lover in your home! Thank you so very much for your time with these awesome dolphin ideas. I am so jazzed!! !